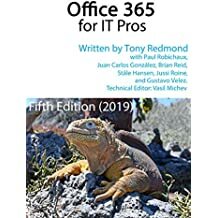 This content comes from a chapter removed from my book Microsoft Exchange Server 2010 Inside Out , also available at Amazon.co.uk (including a Kindle edition ). The first part of the chapter is available in this post. Now let’s get on with some more discussion about public folders. 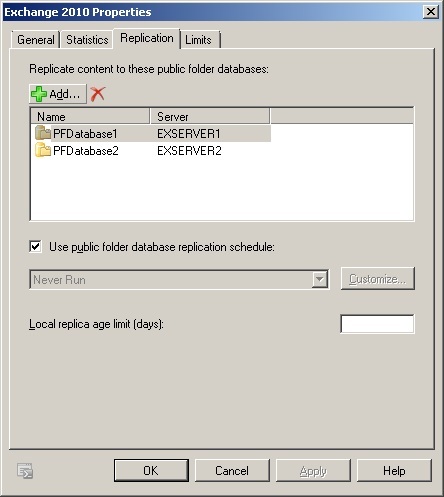 The default state for a public folder is that a single replica exists in the database where an administrator originally creates the folder unless replicas exist for the parent folder, in which case Exchange creates replicas for the new child folder in the databases where replicas exist for the parent. Having a single replica of a folder may be the most appropriate state for the folder if all users are able to make reliable connections to the server that hosts the database. However, in large or distributed environments it is common to create several replicas so that users can always make a local connection. We will discuss how to control the process by which Exchange decides to which replica a client should connect in the “Removing public folders” section. For now, let’s review how to create the replica folders. By comparison to folder content, changes to the folder hierarchy are replicated as soon as they occur, so the addition or deletion of a folder should replicate throughout the organization very quickly. A mail-enabled public folder is able to accept new items via email. If anonymous access is permitted, anyone will be able to create a message, address it to the folder, and send it to Exchange for delivery. A public folder is mail-enabled with the Enable-MailPublicFolder cmdlet. Alternatively, you can select the folder from the Public Folder console and click on the “Mail Enable” option in the action pane. Mail-enabled public folders are listed in the console with a different icon from folders that are not mail-enabled. In this extract from EMC (Figure 2), four mail-enabled public folders are listed. You can also hide a public folder from Exchange address lists by selecting it in the Public Folder management console, view its properties, navigate to the Exchange General property page, and select the checkbox to hide the folder. Hiding mail-enabled public folders only conceals them from users. Even if you hide a mail-enabled public folder from the Exchange address lists, administrators will continue to see these objects listed in the picker dialogs used to select recipients for various tasks such as adding recipients to distribution groups. Behind the scenes, when you mail-enable a public folder, Exchange creates a new object for the folder in the Microsoft Exchange System Objects OU. Figure 4 shows the attributes of a mail-enabled public folder as viewed through the ADSIEdit utility. The new object is used to hold properties of the public folder such as the proxy email addresses, mail tips, and so on. The properties of the new object can then be viewed with the Get-MailPublicFolder cmdlet and manipulated with the Set-MailPublicFolder cmdlet. The mail-related properties that are available to mailboxes, groups, and contacts are also available for public folders. For example, here’s how to set up moderation for a public folder so that only users from a specific group plus the moderator can post items. Any other attempt has to go through moderation. You can disable a mail-enabled public folder with the Disable-MailPublicFolder cmdlet. This will also remove the Active Directory object and the GAL. Afterwards, you can fix the names of the folders to remove any offending characters from their names or aliases and then re-enable them for mail. This command works if the folder has no children. If a child folder exists you’ll be told that you can’t delete a parent folder until you first remove any child folders. You can do this with much the same command by adding the –Recurse parameter to force Exchange to locate and remove any child folders before it removes the parent. In these examples I’ve suppressed the confirmation prompt because I am pretty confident about the folder that I want to delete. A delete of a public folder cannot be reversed as there’s no equivalent of a deleted items folder for public folders or the items that they contain – unless you use the ExFolders utility to recover the deleted folder. Even then, ExFolders might not be able to recover a deleted public folder, so it’s a good idea to be sure that you really want to remove a folder before you proceed to do it. It’s a good idea to clean up old and obsolete public folders on a regular basis. You can scan for folders that don’t hold a lot of content or haven’t been accessed recently. This command fetches the set of folders in the hierarchy as known in the public folder database on a server and generates statistics for each folder before sorting the set by the last modification time before outputting details into a report. Any public folder can be replicated to databases on multiple servers. The public folder hierarchy is always replicated to every public folder database so that each server can present a complete view of every public folder that is available in the organization to clients that request this data. The folder hierarchy lists every folder, its permissions, and details of the servers that currently host databases that contain replicas of each folder. Replicas of every folder do not necessarily exist in every public folder database. When public folders exist in an organization, every mailbox database is associated with a public folder database and clients always attempt to connect to folder replicas in the public folder database associated with their mailbox database. If clients need access to a folder replica that is not present in the database that they are currently connected to, Exchange creates a referral to the most appropriate public folder database that contains a replica. You can view the public folder database that is used by a mailbox database by looking at its properties through the Client Settings tab. 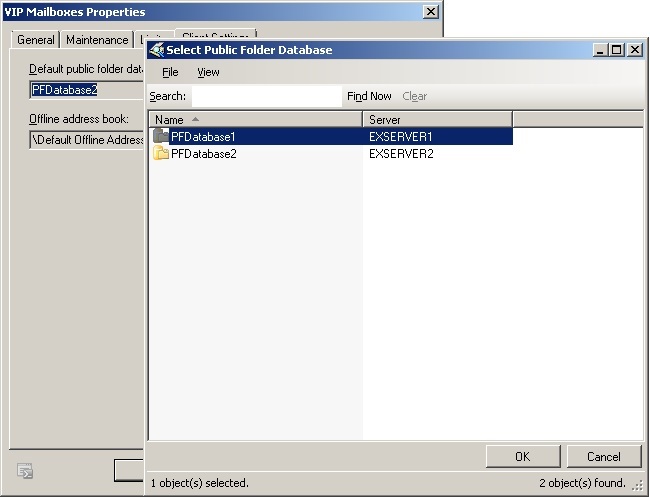 As you can see in Figure 5, the IT Department database currently uses PFDatabase1, so any connections from mailboxes hosted by this database will go to PFDatabase1. If this isn’t the most appropriate public folder database to use, we can select another one – perhaps a public folder database that is hosted by the same server as the mailbox database. The default mechanism used to determine the best referral is based on Active Directory site link costs. First, Exchange looks for servers in the local site to see if there are public folder databases available that contain the required folder. If no local servers are available, Exchange builds a list of available servers that host public folder databases in other sites and orders them by cost. Exchange then attempts to contact each server to see whether they have an available replica and will connect to the first replica folder that it finds. It is possible to ignore the Active Directory site link costs and use a custom referral list instead. To do this, go to the Organization Configuration node of EMC and then Mailbox, and then select the public folder database with which you want to work. Now click Properties To and then select the Public Folder Referral tab. As expected, the default option is to use Active Directory site costs. 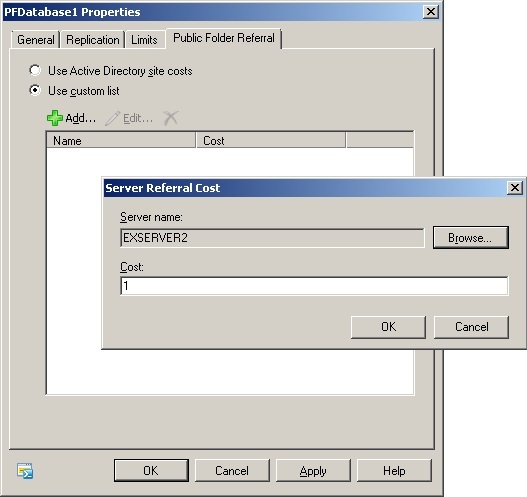 However, as shown in Figure 6, you can create a custom list of mailbox servers (that host public folder databases) and assign each a cost from 1 to 100 to have Exchange use this list when it determines client referrals. Costs are prioritized from lower to higher, so you should assign a cost of 1 (one) to the server that you want to direct client referrals to whenever possible and any other value up to 100 for the other servers. The higher the cost value, the less likely Exchange will use it for client referrals. You can create a custom referral list with EMS too. In the example shown below, we select create a list of three mailbox servers that host public folder databases and assign each server with a different cost to provide Exchange with an order to use to check the servers for public folder replicas. Finally, we tell Exchange to use the custom server list rather than using the default Active Directory site cost. This entry was posted in Exchange, Exchange 2010 and tagged Exchange 2010, Exchange 2010 Inside Out, Exchange 2010 SP1, Public folders. Bookmark the permalink. In one respect, a PF database is exactly the same as a mailbox database when it comes to size. As long as you can protect it in terms of being able to handle day-to-day ups and downs, the data can grow as large as you’re comfortable. With PFs, the issue is how many replicas exist of the various folders and how quickly the replicas can backfill a new replica should the need arise. 150GB isn’t an extraordinarily large PF database, but you do have to make sure that you can handle a problem such as a major disk outage or a corruption of a database. I’d be comfortable with three replicas of each major folder (there will always be folders that aren’t very important and remain singular). The problem I see with a 150GB PF database is manageability. How many folders, what do they contain, what are they used for, is a replacement repository available, how and why do folders grow, and so on. Exchange doesn’t really have the best of tools to figure out these questions but I do think that you need to have at least an opinion on this points before you can expect to manage the database successfully. Good articles. I love the cockroaches analogy. One setting on folders in ESM was message replication priority. I understand that now messages are based on database rather than folder properties, but I can’t find where to set the message priority in Exchange 2007/2010. Is it possible to do that? If so, where? According to Exchange 2010 help, the only reference to public folder replication priority is for backfill. Maybe Microsoft hasn’t coded a replication priority in the cmdlets used for Exchange 2007/2010. Sort according to server status. Servers that are down or unavailable drop to the end of the list. Sort according to preferred backfill server (if any). Exchange checks the public folder database object in Active Directory for a preferred backfill server. This setting is seldom used. In most circumstances, the backfill process operates most efficiently if Exchange selects a backfill server automatically. Most deployments of Exchange don’t need a preferred backfill server. Microsoft Customer Service and Support can provide a script that sets a preferred backfill server if your deployment requires it. Sort according to transport cost (lowest to highest). Servers in the same routing group have priority over servers in remote Active Directory sites. Sort according to Exchange version (newest to oldest). Sort according to the number of necessary changes available on the server (largest to smallest). Servers that don’t have any of the missing changes are dropped from the list. If one server doesn’t have all the necessary changes, Exchange selects the next server in the sorted list and sends a backfill request to that server as well. This process is repeated until all of the changes are requested. Ok so my question is if none of my folders are currently set to replicate and I want to replicate them all to my other mailbox server how do I do this without going thru and changing each and every one of them? Of course, I would test things before deploying into production! I’m currently migrating from Exchange 2007 to Exchange 2010, and as you mentioned, PF replication uses SMTP, so do i have to mail enable all the folders, or will they normally replicate without doing that! PF replication occurs in the form of special messages that are handled by the mail transport system. You do not have to mail enable any of the folders. This is only required if you want to address email to a folder and have Exchange deliver the messages to that folder. Thanks for your great advice on Exchange issues, Tony – we’ve migrated from Exchange 2003 to Exchange 2010. We had nearly 900 mail-enabled public folders – only about 100 really needed, the rest were created by default due to a poor setting in Exchange 2003. I now need to get a list of all public folders and their aliases but I haven’t been able to find an example of a script that can get that for me. I can only find get-publicfolderstatistics information for single public folders, nothing to generate a list of all public folders and their primary addresses and their aliases. Do you have any examples? I have a PowerShell script that collects just about everything from Public Folders, including email addresses. It saves everything to a tab delimited txt file for easy conversion into Excel. It has over 400 lines. Is there a place I can post it to? Feel free to post the script here. I don’t think that 400 lines of text will cause many problems! Here is my script to gather Public Folder data. I’m not a scripting guru, so I’m sure it can be made more elegant, but it works for our purposes. #It expects to find the file c:\Drop\PFActiveEmail.csv. For us it contains an export of active email addresses. #or get all of them by uncommenting/commenting the appropriate lines. $AssocItemSize = $Folder.TotalAssociatedItemSize.value.toKB() #Attachment size? $AssocItemSize = $CurrPF.TotalAssociatedItemSize.value.toKB() #Attachment size? Have you seen any cases where a public folder is not mail enabled but is in fact mail enabled in the background? I’m just wondering if it is something cooky in my environment or if it is really a known issue. I have a ton of folders that are not mail enabled but if you look in adsiedit they have mail enabled properties. In the EMC, they do not show any mail enabled properties. If in some cases I go ahead and mail enable them to get the mail properties and then mail disable them, they are still mail enabled. Seems like the only way to really get them to mail disable is to remove the mail properties through adsiedit. I’m also thinking that alot of these public folders existed back in the Exch 5.5 days. We recently transitioned to Exch2010, but the issue was there before 2010 and I haven’t removed all of the exch2007 public folder replicas yet. I haven’t seen this problem before so it might be worth your while reporting the issue to Microsoft to ask them to investigate, just in case something kooky is going on. Is it possible that you ever had an add-on or some other code that might have mail-enabled all teh folders, especially well back in the dim and distant past? We have this issue as well in our PF structure of ~25K folders, many of which came from Exchange 5.5. Though we haven’t opened a case with Microsoft, we have researched it with our Microsoft rep to no avail. The easiest way to mail-disable them is to delete their Microsoft Exchange System Object (MESO) in AD Users & Computers. One fo the outputs of the script I submitted earlier is the MailEnabled attribute of Get-PublicFolder. Most of our mail-enabled folders are flagged as not mail-enabled, though in fact they have mail attributes and receive mail. We are migrating our Public Folder content to SharePoint. Once a part of the structure is migrated, we don’t want mail going to the folders. Since they think they’re not mail enabled, Disable-MailPublicFolder doesn’t work. The script I’m pasting below requires Quest’s free ActiveRoles plugin for Powershell. I have it as a portion of a longer script that takes as input a portion of the output of the aforementions script for gathering PF statistics, but I don’t have time to clean it up. This scriptlet will delete the MESO. You would have to supply the MESO & LEDN. What if I want to output properties from both Get-PublicFolder *and* Get-PublicFolderStatistics? I’m having a lot of trouble with this. I have no problem generating a CSV with the fields from one or the other command, but I can’t seem to get a CSV that has all the fields. I think you’ll have to put the fields that you want for each folder (from the Get-PublicFolder call) into variables and then output them alongside the fields from the Get-PublicFolderStatistics call in formatted lines. There’s bound to be some good examples of how to do this on the net… I just don’t have time to search right now. We have several mail-enabled public folders in a mixed 2003 and 2010 environment. There are no replicas on 2003. We are removing 1 replica (server01) in 2010 (leaving 2 others), but when we do the mail enabled public folders stop receiving mail from internal only. External emails can still be delivered to the folders without issue. If we put the replica back on server01, all of the emails get delivered. It’s almost like there’s something with the mail enabled piece that doesn’t get replicated to server02 and server03. These folders had spaces in the aliases originally, but that has since been removed. Any ideas what the problem could be? Would it have anything to do with the routing group connector? I think it’s time to log a call with Microsoft support and have them do some tracing to figure out what’s happening with messages not being delivered to a replica. I don’t think that this is a problem that can be resolved through a blog. This makes the msExchOwningPFTreeBL = Serv3. When I send mail to a mail enabled PF, the mail goes to Serv3 first then shows up in Serv2 according to my replication schedule. Each of the PF databases refer to each other. Yea cockroaches!! Why would it not attempt to send to the PF db on Serv2? I turn Serv3 back on and the mail gets routed…. No words of wisdom. Frustration perhaps. I was wondering if you had any thoughts on the following scenario. We migrated from Exchange 2007 to 2010. The Exchange 2007 public folder database is still there as it is the only other replica that exists and I have been a bit hesitant to get rid of it until I know there are more replicas in place. I started doing this very thing last week and have been perplexed by the results. When I did the initial migration I used the “AddReplicaToPFRecursive.ps1” script to add replicas on the new Exchange 2010 server. Immediately upon adding the replicas, the data began replicating from Exchange 2007 to Exchange 2010. This included all data (new items and existing ones). I am now adding a second Exchange 2010 PF Database and have added it to the Public Folder Replicas in exactly the same way. However, instead of seeing the data begin replicating immediately, I am finding that only new items replicate to the new database. If I open the Public Folder Management Console and do an “Update Content” on a specific folder, all the existing items replicate successfully. 1. Do you have any idea why this is the behavior and is it intended? 2. I have about 10,000 public folders and cannot do a manual “Update Content” for all of them. I imagine I can script it and have the script do a recursive “Update Content” on all the public folders, but is that necessary and is that how you would recommend doing it? Thank you so much for the quick reply. Yes, it looks like the backfill is not properly replicating unless I force an update on the Public Folder. I have increased all of the Public Folder Replication logging to Expert, but don’t really see any errors that lead me to any real conclusion about why this might be happening. I think I’ll just have to run a PowerShell command to update all the public folders. I’d rather not have to do it this way, but I don’t think I have a choice. Okay, I don’t really have ANY mail-enabled, but when I run the ‘get-mailenabled’ thing you mentioned, it says a number of my folders are corrupted. All replication from 2007 to 2010 seems to have come across cleanly – i did “get stats” and made sure all item counts were good, AFTER i did the “AddReplicaToPFRecursive.ps1″ that you folks were discussing. 1) I did NOT do the “move … .ps1” script – instead, I chose to “replicate” all folders, including OAB and system folders – we don’t really have that many. 2) No matter what method is used, it seems whatever ADSI attribute related to a so-called “site server link” still remains pointed to the old PF area. Does this sound normal? I know it needs to be changed and there are some related articles on that topic. OOPS! My Data is on Server A! If I go ahead & create a PF DB on Server B, then HOW do i accomplish replication WITHOUT wiping out my OAB info on Server A? I think it should be “Genration” point, not “Origination” point – right? Anyway, I think that I should have my “Generation server” be the same server on which the PF DB resides, right? That makes sense to me anyway. And then, I should create PF DB on the 2nd Exch 2010 server, and then set up replication. BUT again, I DON’T want to overwrite my existing OAB that I replicated already – so any tips/hints would be greatly appreciated. Thanks. Hi Tony and thanks for another useful article. 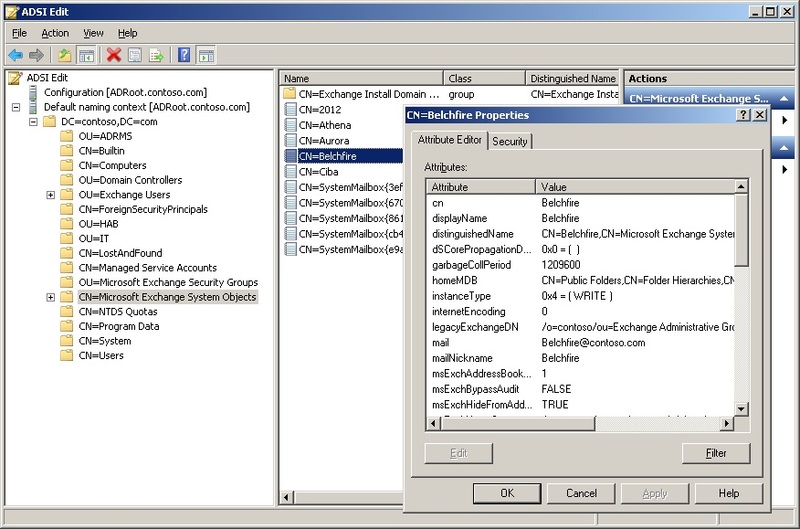 I would like to ask what happens in the case where you have an Outlook 2007 client whose Public Folder Database is on Exchange 2010, but whose target PF replica is housed on one of any Exchange 2003 servers located in various Routing Groups/Administrative Groups. Can you advise both how the referral process works in this case and also how it is possible to control the preferred targets using PF Referrals (Affinity) ? I don’t have an Exchange 2003 server to try this out against, but I assume that referral will work in the same way as with other versions. In other words, the client will receive a referral from the Exchange 2010 server to the lowest cost Exchange 2003 PF server that contains the replica. I have a silly question. How/or does one extract actual item level details from a Public Folder. Specifically, If Get-PublicFolderStatistics shows that I have 1067 items in a Public Folder sub-folder, that I know is a public calendar folder (not mail enabled); how do I get to calendar details for this folder like subject, start time, end time or duration, etc. Use ExFolders (http://blogs.technet.com/b/exchange/archive/2009/12/04/3408943.aspx) or a MAPI client to open the folder to view the items? Before you read further, let me tell you that I am very grateful for this information. Is there a way to do this via the management shell/powershell (preferably without using EWS). I am not the Exchange administrator, but (at the moment) have remote desktop access and may be granted longer-term remote powershell capabilities on the server. What I am trying to do, specifically, is create a long-term periodic batch job for extracting public folder calendar information in order to populate a publically viewable web calendar in order to book these resources (the calendars are for reservable meeting rooms). So, I have been told to assume that the end-user will very likely not have access to Sharepoint or Outlook. Google calendar will not work for this calendar sync problem because it will only automatically sync my personal default calendar. I am not sure how hip the Exchange administrator will be to providing ExFolders on the server. If he is willing, and based on these further details of my task at hand; do you still think that this is something ExFolders would allow me to do and to automate with task scheduler? When I do a: Get-PublicFoldersItemStatistics for one of the calendar folders, I can see some meaningful output like subeject and identity. Will these very long ID(entity) numbers lead me to the other items of interest (start times, dates, duration, etc.)? I honestly don’t think you are going to get the information you need through PowerShell. It was designed as a management interface and not as a client interface. EWS is what you need to use. Head over to Glen Scales’s site http://www.gsexdev.blogspot.com/ and pose your questions there. Glen is a great guy and a wonderful EWS coder. I bet he can help you. I’ll head that way. I appreciate the guidance. I was going nowhere quick, but now I have a plan. Thanks, Tony. Thanks for this article! Good stuff. I got a question hope you can help me out. I’m currently running Exchange 2003 SP2 and will be migrating to Exchange 2010 SP1, we will a 2 node DAG and since DAG node members cant host public folder databases I have decided not to support public folders but instead use Sharepoint for any document sharing, collaboration, etc. Other offices (located in other regions America, Europe) do support Public Folders and my users were wondering if they could still have access to the public folders in other regions. From what I read, I should be able to specify a default public folder database on each database meaning I could point this to a public folder store in US or Europe and my users could have access to PFs using Outlook 2007 client, but how about Outlook Web App. When testing this in the lab I get the following error “The public folder you’re trying to access could not be found because there is no Exchange 2010 public folder server”. Does this mean, they would be able to connect to PF using Outlook but not Outlook Web App because the database is not located on a Exchange 2010 Mailbox Server? DAG node members can host public folder databases. However, the public folder databases use their own replication mechanism that is different to the log shipping mechanism used to update databases within the DAG. The guiding principle of PFs since their inception has been to keep data close to users. With this in mind, I think I would have a PF database on a DAG member and direct clients whose mailboxes are on Exchange 2010 to that PF database. Note: I have not set the Offline Address Book under Client Settings on any of my databases, I was not sure if this was the only thing missing. Have you looked at http://blogs.technet.com/b/exchange/archive/2007/04/19/3401966.aspx to see the common causes for the error condition that you’ve encountered when downloading the OAB with Outlook 2007 to determine whether any of these states pertain to your deployment? Or even better, the advice given by Dave Goldman at http://blogs.msdn.com/b/dgoldman/archive/2008/10/01/understanding-why-error-code-0x8004010f-is-thrown-when-trying-to-download-an-oab.aspx (Dave is the guru when it comes to all things to do with the OAB). I don’t think so… But then again, I have not tried. Yes, new folders are created on a daily basis. For example, our marketing dept. handles creation of new proposals and sets up a public folder as placeholder for all emails. By default, that PF is not mail enabled, so the PM of the new proposal immediately contacts our department claiming the folder isnt working, we go into EMC and mail enable it. Of course they can drag and drop at this point into the PF, but not as clean and easy as cc: to the PF. Thanks for you feedback. I found very interesting acticle. I try to understand how email-enable public folder works. When I send a message to the public folder, the user who is associated with the public record (A) receives the message instantly but those associated with the public record (B) receives the message with the time of replication. Thanks for the above information. I have a Windows 2003 AD and Exchange 2010. I setup the public folder with email enabled. My question is how do I create the AD user and link it to this public folder? Thanks for any help. This issue comes up on a pretty regular basis. Have you migrated from Exchange 2003? Do you have any replication issues in the environment? Have you looked in the connectivity logs to see what problem the transport system is reporting when it attempts to deliver email to a public folder? See http://get-exchange.blogspot.ie/2009/11/public-folder-mayhem-exchange-2010.html for an example of the kind of issues that people have run into. In this instance it was a lingering AD object from Exchange 2003 that seemed to be the root cause. Also see http://workinghardinit.wordpress.com/2010/05/25/exchange-2007-2010-public-folders-issues-the-active-directory-user-wasnt-found/ for much the same problem. Or even http://social.technet.microsoft.com/Forums/en-US/smallbusinessserver/thread/936ad0f7-dd06-4abd-b741-cc66dff95eda. On section, mail-enable public folder I have a question. I have two database with replication and If I understand he has a database that priority over the other, and if the prioity database is offline no email is delivered. why? There are a number of other suggestions in the TechNet forums. I like the idea suggested in this note though. In your case I would create a content type around that document template and bind my event receiver to that content type. Walkthrough 3 describes how to develop an event receiver for a list content type. You can easily do the same for a document library content type. Great article! I would like to move from EX07 to EX2010 and am in a large environment. I would like to move the PFs over one at a time as not to break important workflows and daily process. How can I accomplish this task? Tony, can explain how a transport server decides to which replica it will deliver inbound Internet messages? We have an enviroment with two PF databases with replicas of all folders on both servers that are in the same AD site. When one of these servers is unavailable (i.e. HT cannot connect to it), messages queue up on the HT. It seems to me that when one PF server is unavailable a HT should try delivering to the other PF server, but it doesn’t. If the PF server is going to be down for awhile, what can be done to force delivery to the other PF server? Is this the same problem reported in http://support.microsoft.com/kb/2536846? If so, the problem is apparently fixed in Exchange 2010 SP2 RU4. Great article, packed full of useful information. I ran across the article searching for an answer to another question which you may be able to answer here. I have user that was an owner to 5 or 6 public folders that were migrated from Exchange 2003 to 2010 (along with all of the other public folders) He cannot access these 5 or 6 even though he still shows as an owner of the folders after migration. I also noticed those same folders are greyed out when I’m looking at the entire list under default public folders in the EMC. I’m assuming that may be because they are not mail-enabled but haven’t tested that yet. Last thing that seemed odd on these public folders is that they were not replicated to the other Exchange server upon migration when all the other public folders were. It may have been that way on the Exchange 03 server but I didn’t notice, they were created before my time with this company. If you have any clues why the owner of the public folders can’t access them while others can let me know.